Beat This Caption Contest 175 Winner – Caption Contest Funny Clever Witty Enter Today! Even though it was her Funeral, they still propped Gram up for one last Family Christmas Photo! 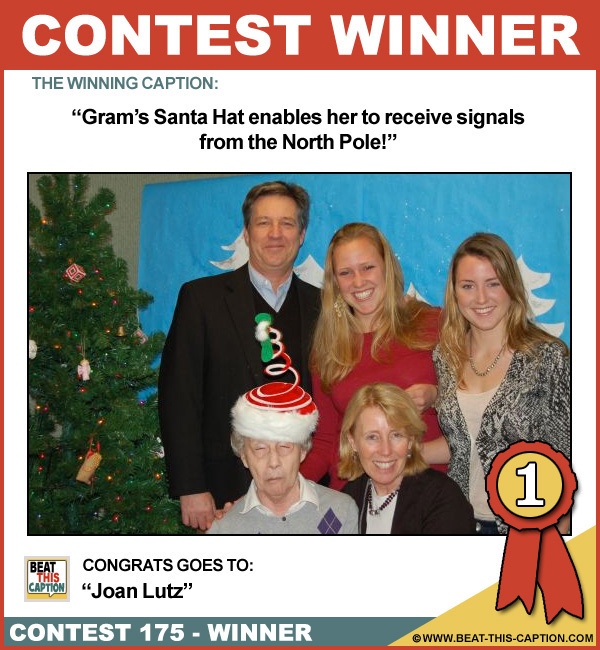 Gram’s Santa Hat enables her to receive signals from the North Pole! HA! Just imagining that makes me laugh! BAH! Great Caption! :) You WIN (again)! Gran proves that one in five people these days are Chinese! Gram was an excellent crafter,but she just couldn’t get her ‘Marshmallow Fluff/Red Vine’ hats to catch on! The useless old woman was turned into an SUV sippy cup holder, for the children! Hurry up and take the photo before she defrosts!